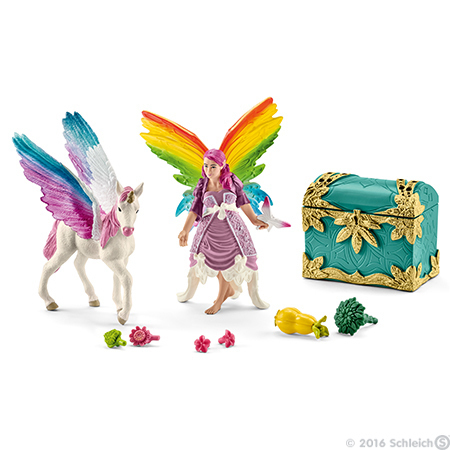 Rainbow Elf Lis with Pegasus Unicorn Foal Figurines from Bayala series. Made by Schleich in 2016. Lis figure comes with a a beautiful Pegasus Unicorn Foal and other some small accessories. The chest trunk can be opened and individually decorated. Brand new, never used or played with. Figurines come in original Schleich packaging. Lis and her pegasus foal are flying through the sky. Their wings are glittering in all the colours of the rainbow. They must be looking for new adventures again. There are new things to discover everywhere ? the world is full of hidden treasures. Whenever Lis finds something special, she places it securely in her treasure chest. The chest is filled with mysterious stones, dried plants and other things she has found. When Lis and her pegasus foal return from their adventures in the evening, she lovingly tends to the foal. She grooms him and gives him his favourite food. Would you like to go on an adventure with them?